Summary: The BJP’s emerging hegemony should not be conflated with electoral invincibility. 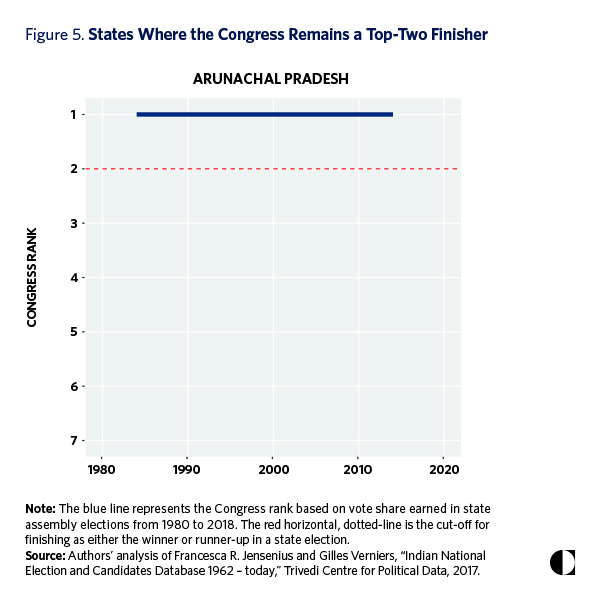 As recent elections have demonstrated in states such as Bihar, Delhi, and Karnataka, the party is fallible. When the BJP swept to power in the Lok Sabha in May 2014, it remained a distinct minority in the Rajya Sabha (see figure 8). Divided control of the two parliamentary chambers made the BJP unable to unilaterally enact its legislative agenda without making common cause with the opposition. At the start of the Modi government’s tenure, the BJP claimed only 17 percent of seats in the upper house, compared to 29 percent for the Congress (with the balance held by other parties). In 2017, for the first time, the BJP’s tally surpassed that of the Congress. The BJP’s share has steadily risen to 30 percent while the Congress share has plummeted to 20 percent. When the BJP’s NDA allies are included, its current share of seats rises to 37 percent (the corresponding share for the Congress’s United Progressive Alliance is around 27 percent).